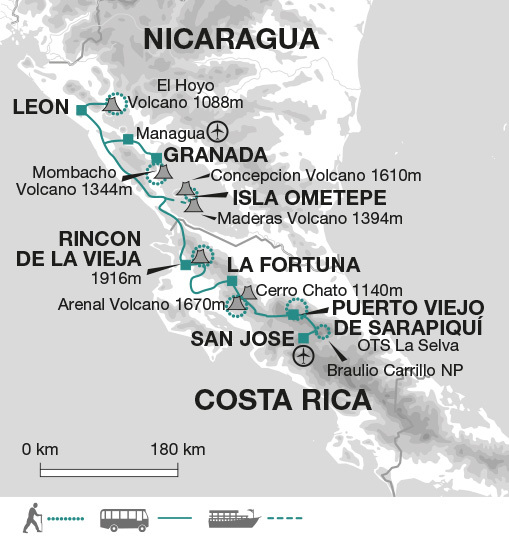 This walking holiday in Central American journeys through the contrasting countries of Costa Rica and Nicaragua. Hike up volcanoes, discover remote waterfalls and explore the tropical forests, seeing the diverse wildlife living in the tree tops. Trip start in Costa Rica's capital, San Jose, in the country's Central Valley. This morning after breakfast we travel to Braulio Carrillo National Park, where we take a short walk through the tropical forests. This protected area, though only a short distance from the capital, is a significant natural reserve and home to over 500 species of birds and 150 species of mammals, including howler and white faced capuchin monkeys. On our return to our bus we continue our journey to Puerto Viejo de Sarapiqui. Today's introductory 0ne-and-a-half kilometre walk is expected to take around one hour with 300 metres of ascent and descent, through tropical forest. Today we visit La Selva, the Organisation for Tropical Studies' biological station, and follow the trail through their primary forest with a local guide. En route we learn about the flora and fauna here and about the station's research. The afternoon is free and optional excursions include white water rafting, a hike around Tirimbina Reserve and a chocolate tour (please note that you will only have time to do one of these activities). This morning we leave Sarapiqui and travel for around three hours to La Fortuna, close to Arenal volcano. Arenal Volcano has until recently been one of the world's most active volcanoes, but since 2010 activity has reduced. It however continues to have a dramatic and picturesque presence in the area. It is surrounded by rainforest which provides great hiking and has a large attractive lake to the west, formed as part of a hydro-electric power scheme. In the afternoon we take a gentle walk in the national park to learn about the area. This evening, we can enjoy an optional bathe in nearby hot springs or a two hour night walk. Today's five kilometre walk is expected to take around two hours with 100 metres of ascent and descent. Today we travel by truck the short distance to the town of El Burrito, the starting point for our walk through the protected rainforest. Following the trail through the rainforest, which is in the transition to a cloud forest, we pass over small streams and keep a lookout for wildlife in the trees including white face monkeys, howler monkeys, sloths and many bird species. We'll enjoy a break and snack at Horacio waterfall before continuing to Burrito waterfall. Here there will be time swim in the pool at the base of the fall. Returning to El Burrito the trail leads us over small streams and past cassava, sugar cane and fruit plantations. Today's seven-and-a- half kilometre walk is expected to take around five hours with 400 metres of ascent and descent. This morning we depart for Rincon de la Vieja. We drive part way round Arenal Lake before heading north- west to another national park with an active volcano, Rincon de la Vieja. Here we stay in a lodge not far from the park entrance. After driving into the park we begin our hike through Rincon de la Vieja Volcano National Park to a local Waterfall. Within the park we willl walk through the dry tropical forest, keeping an eye out for white faced howler or spider monkeys and other flora and fauna surrounding us. On our return it is possible to include the 'Pailas Loop' to see more of the park and evidence of volcanic activity, mini geysers and bubbling volcanic mud. Today's waterfall hike is six kilometres and expected to take around four hours with 200m of ascent and descent. The additional Pailas Loop is another four kilometres and two and a half hours. Today we leave Costa Rica, crossing over into neighbouring Nicaragua. We travel to Lake Nicaragua, one of the world's largest freshwater lakes, and take a ferry across to the volcanic island of Ometepe. Ometepe has been home to indigenous tribes and cultures for many centuries, demonstrated by the pre-Colombian petroglyphs and artefacts found here. The island was made from the formation of two volcanoes - Concepcion (1610m) and Maderas (1394m) that give the island its distinctive profile as you approach the island by boat. On Ometepe we stay in a small natural reserve on the shoreline. Today's one-and-a-half kilometre walk is expected to take around one hour along a flat route. After breakfast we drive to the start of today's hike to San Ramon Waterfall. The waterfall is on the southern slopes of Maderas Volcano, about four kilometres from San Ramon village. We walk through dense jungle, home to howler monkeys and a wide variety of birds and butterflies, some of which are endemic to the area. The waterfall is most impressive during the rainy season when there is the most water but remains a beautiful spot throughout the year. Along the way to the waterfall we will see the pipes from the local hydroelectric station. The crystal clear water from here is also bottled for drinking. This afternoon we can take an easy walk around the nearby lake to a viewpoint. Today's eight kilometre walk is expected to take around four hours with 400 metres of ascent and descent. Today we take the ferry back across the lake to drive north-west to the colonial university city of Leon, home to the countries main universities. In the afternoon we take a walk around the fascinating old town with its historical buildings, churches and cathedral - listed as a UNESCO World Heritage site. Our walk today is on a distinctive volcano - El Hoyo can easily be recognised from a distance by the large hole in the on one of its slopes, and is actually a complex of several volcanic structures, the most significant of which are two round craters and several fumaroles. We arrive to the start of our hike by driving through Los Maribios, Nicaragua's impressive volcanic chain. As we ascend we will have views down over other volcanoes and Lake Managua, the large lake to the north of Lake Nicaragua. Today's 12 kilometre walk is expected to take around seven hours with 500 metres of ascent and descent. Granada, on the shores of Lake Nicaragua, was founded in 1524 and is thought to be the second oldest Spanish city in Latin America. Today much of the city centre has been renovated and it has a pleasant, relaxed atmosphere. On our arrival we take a tour of the city including the Merced church and a local market. The rest of the day is free to explore this attractive city further or relax in one of the many cafes. Covered by cloudforest, Mombacho Volcano can be seen from Granada. This morning we drive to the top by four wheel drive and visit the scientific station there. We then take a guided hike along the Puma Trail, learning about the volcano and the flora and fauna found in this special environment. From the top there are stunning views down to Lake Nicaragua. Today's seven kilometre walk is expected to take around four hours with 400 metres of ascent and descent although this will feel like more due to the amount of ups and downs. Today we have a free day in Granada. Possible optional excursions include a boat trip or kayaking through Las Isletas on Lake Nicaragua and a visit to Masaya Volcano. We drive to Managua airport where our trip ends. Although entirely voluntary, tipping is a recognized part of life in this region of the world. Some local staff will look to members of the group for personal recognition of particular services provided. In order to make things easier for you, the Explore Leader may organise a group's tips kitty and if this is the case, they will account for it throughout the trip. For this trip we recommend US$60 contribution. Please allow US$20 for border taxes. Costa Rica: Citizens from the UK, US, Canada and most E.U countries do not require a visa for a stay up to 90 days. Citizen of Australia, New Zealand and the Republic of Ireland do not require a visa for stays up to 30 days. Nicaragua: Visas are not required for UK, New Zealand, Australian, US and Canadian citizens. There is an entry charge of 10USD. Other nationalities should consult the relevant consulate. 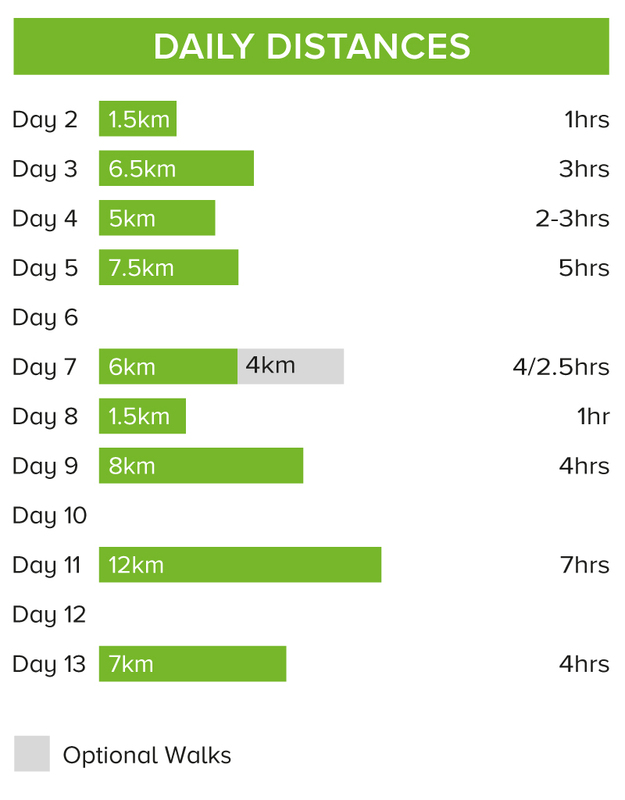 Walks on 9 days for between 1 to 7 hours. Some of the walks are graded easy but the trip is graded moderate overall as walking through rainforests and in the tropical heat and humidity requires more energy.